The catastrophic flood of Noah’s day, not only wiped all traces of the antediluvian peoples from the face of the earth, but also changed the geographic landscape of the earth’s continents. It was during one of Shem’s descendants, Peleg’s (Gen. 10:25) era, which the earth was divided. There is much speculation and discussion about what this exactly means, but a curious note in the Book of Jasher (2:11) says--It was Peleg who first invented the hedge and the ditch, the wall and bulwark: and who by lot divided the lands among his brethren. Along with centuries old scholarly discussions on the subject who have debated between some violent and sudden form of continental drift, or the separation by mass migrations of the offspring of Noah, either way, it happened during Peleg’s day, which was around 111 years after the flood. Keep in mind, that Genesis 10, provides an overall summary of Noah’s descendants and their dispersion across the face of the earth and is summarized as such in verse 32. When proceeding on to Genesis 11, take note that mankind is united there on the plains of Shinar near Babel so that Genesis 11:1-9, is an expansion of just one of the grandsons of Noah (as mentioned in chapter 10), prior to their global dispersion from Babel. It has been shown in this paper that, based on biblical, historical, geological, and geographical evidences, the Tower of Babel was most likely built in the Khabur River triangle of North Syria, somewhere inside a triangle marked at its points by Tell Brak, Tell Aqab (near Amuda) and Tell Fakhariyah; and could not have been located anywhere in southern Mesopotamia, as has been traditionally believed. If you were building a tower, which in part, was to serve as an escape for a future flood, you wouldn’t build it in a flood plain. You’d start in the mountains or on higher terrain. It is likely, given the proximity to the time of the flood itself, most if not all of southern Iraq, would still be under water. It remained marshlands up until the time of Saddam Hussein, who drained it in an attempt to punish the Shia Muslims native to that area back in the late 1980’s, early 1990’s. The current borders we have, are largely artificial arrangements from the Sykes-Picot Agreement (1916), which resulted in the British and French carving up the Middle East upon the conclusion of World War 1 and the collapse of the Ottoman Empire. Historically, by the time of the Babylonian kingdom- through the Seleucid Kingdom (312-63BC), Babylon and Syria were largely synonymous. But the location aside, we now turn to the “why” of the tower. It is as innate to man to want to ascend into the heavens, as it is of animals to follow their natural instincts. The reasons man wants to ascend, is that man was created in God’s image (Gen. 1:26-28), and man was built with eternity in his heart (Ecclesiastes 3:11). In other words, man is not just a physical being, but also a spiritual one. And when Adam and Eve fell at the Garden, they forever severed that divine connection they once had. Man’s actions at Babel were in open rebellion against God’s directions in Genesis 9 to spread out over the face of the earth. It would seem that God’s Rainbow Covenant with mankind in Genesis 9, was either not remembered, or was lost to subsequent, post-flood generations. The Apostle Paul wrote that Satan’s domain is not in some dark, shadowy cavern of Hell, but in the air. (Eph. 2:2) Satan resides in what we would call, the first and second heavens, or the atmosphere and space surrounding earth. Nothing good would come of building in the ‘high places’ that reached into Satan’s domain. Some have suggested that they were attempting to build a ‘star-gate’ or inter-dimensional portal to reconnect with the supernatural world as they once had before the flood. Considering that we are doing the exact same thing now with projects like CERN, it’s not unreasonable to assume that man was incapable or unwilling to attempt it. We get the clearer picture in Genesis 18-19, of what life was like there in Sodom and Gomorrah during Abraham and Lot’s day. Clearly, God didn’t destroy the world with a flood for marrying, eating and drinking. Neither did He wipe Sodom and Gomorrah off the face of the earth for eating and drinking, buying and selling. The pre-flood world was a time of extreme corruption, deviancy, and wickedness. Sodom and Gomorrah was a place of the same making. A microcosm if you will, of what life was like before the flood. (See 2 Peter 2:4-8, Jude 1:6-7) Babel was the way station between the two. 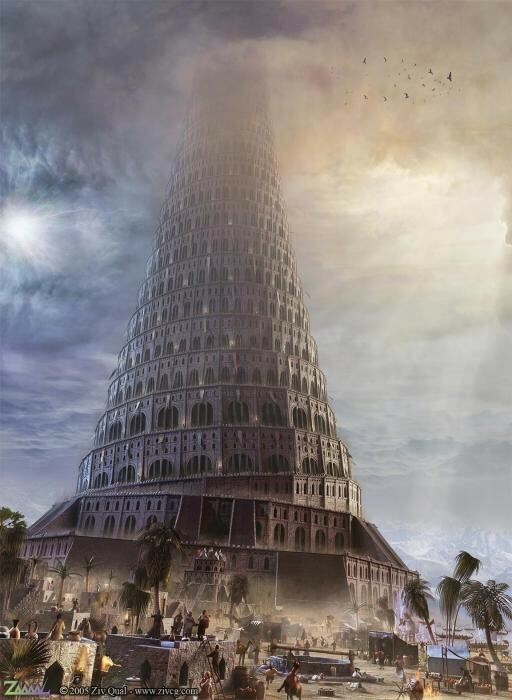 The Tower of Babel incident, forced God’s hand to act in the interest of mankind. Granted, it wasn’t a surprise to God, as He is omnipotent, but He knew He would have to act on account of the disastrous potential there. It shouldn’t surprise anyone that as we (this generation) draw closer to the final moments of human history that we not only see this convergence of prophetic signs but we also see the amalgamation of cultures and beliefs back towards a singular system. This return towards unification as it were, being the largest, yet most overlooked sign, serves as clear, providential evidence of where we are on God’s calendar. We’ve seen in just this past century, man’s ability to overcome this separation with the endorsement of English as the universal language. This is because for the two centuries prior to American dominance, the British Empire was worldwide, and they of course, spoke English. Just as the geo-political conditions were perfect for Christ’s first coming, (pax romana, universal Koine Greek language, Roman roads), so too is our day primed for another direct divine intervention. We have the technological means to overcome linguistic differences through artificial translators. We have launched into space. We are attempting again to build inter-dimensional portals. We have made the world small again with the advent of the Internet age. Wickedness and violence are the norms of the day. Homosexuality and other deviant lifestyles are being promoted as the “new normal” by the highest levels of political office around the world. Anyone who dares to stand against this onslaught of lawlessness, unfortunately, often feels the wrath of the full weight of the political, societal, and media powers upon them. Man’s attempt to reconnect with the divine outside of Jesus Christ and the Bible simply reinforces the reality that man is not just a flesh and blood being, but also spiritual. Man desires something greater than himself, yet apart from God. This was why man turned to the dark arts and secret knowledge in the past in order to gain access to that divine power that he once had access too.